The Diffuser Filter Set for the smoke tube. The diffuser filters big particles, i.e. tobacco parts. Above all, it divides the smoke into little blisters. The smoke cools down effectively and more harmful materials kept in the water. An absolute must for a mild smoke pleasure. Besides bubbling with this filter is quieter. 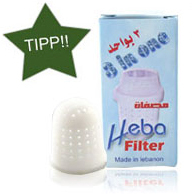 To increase the effectiveness, the filters can be combined.